This week marked 20 weeks–or 5 months–since our Gotcha day. When I took Maggie to Birmingham at the beginning of January the occupational and speech therapists were concerned that she wasn’t progressing quickly enough. It was recommended that it was time for us to initiate speech, occupational, and physical therapy here in our local community now that attachment is well established. Honestly, it has taken about a month just to get all that in place. I started making phone calls on January 3rd but it seems like the wheels turn very slowly, particularly because we are using a government-subsidized program for some of her therapies. By going through the Families First/Babies Can’t Wait program I can use therapists who will come to our home and thereby avoid having to drive an hour each way for Maggie’s therapies since there are no other therapists in our area that specialize in physical or occupational therapy for children. Our particular program does not have funding for speech therapy, but I was able to find a wonderful local speech therapist on my own who can work with Maggie. Maggie has finally had all her evaluations and we were very encouraged by how everything went. 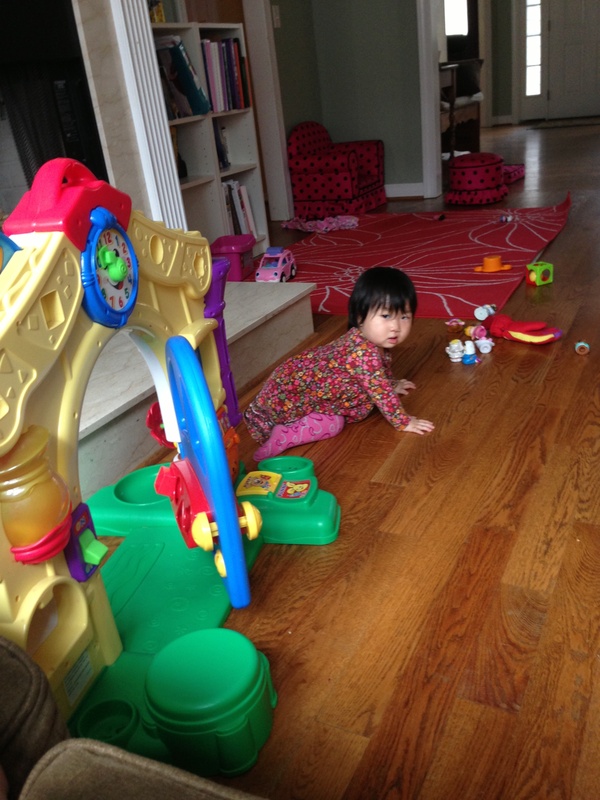 She is significantly delayed in her gross motor skills so her primary work will be with the physical therapist. 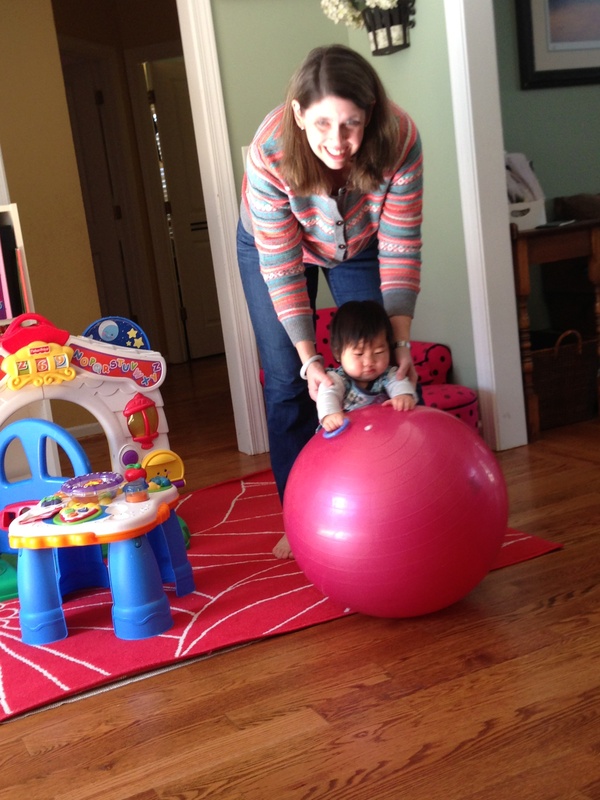 The PT encouraged me that I am already doing a lot of the things she will also do with Maggie, such as working with her using the exercise ball. She bounces up and down, and I roll the ball from side to side so she can re-balance herself, and since January we have also added an exercise where I lay her on her tummy and roll her forward while she puts her hands down to catch herself. Since she never learned to crawl it is important that she get that reflex for catching herself so that once she starts to walk she will have a self-defense mechanism in case of falls. I am continuing to help her work on pulling up to stand from a “bench seating” position–I sit cross legged and she sits on my ankles, which gives her some height so she can get her legs under her. In this way she can easily pull up to stand, though she cannot do it from a seated on the floor position. We are supporting her as she plays while standing at a low table so she strengthens her legs. She can do this pretty independently, and can even let go with one hand while standing, but someone needs to be right behind her so she doesn’t fall as she gets tired easily. I still put her on her knees on the floor and on the ball, and she still wears her “hip helper” pants every day, but ever since she learned how to scoot on her bottom she has shown no interest at all in crawling. Not that she ever showed interest before….Anyway, by the time I could get her to support her weight on her knees for any length of time without crying she had learned to bottom scoot, and now she has no motivation to crawl. Sometimes Maggie tries out a crawling position but she never goes anywhere with it. Crawling is very important for her brain, so she will need to learn how to do it but at this point it is most likely not going to happen until AFTER she learns to walk. Sometimes she bends her knees on her own and leans forward on her hands, but she never gets beyond that position by herself, and when we try to help her she just sits back up as soon as she can and starts scooting again. Her current goals are to strengthen her core, to learn how to pull up to stand, and to progress from there to creeping and walking. Maggie did really well on her fine motor skills. She has turned a corner since early January in many ways, and although she didn’t appear to be progressing very well when she was seen on January 2nd by the time she was seen again at the end of the month she had made some strides. The occupational therapist will only be meeting with us once a month to coach me on how to work with her and help us stay on track with her goals. When we saw the OT in early January she had just learned how to put a ball into a basketball hoop. Now she has learned how to put large plastic coins into her pink piggy bank, and can put shapes in a shape sorter with some help (we often need to cover the incorrect holes and she can take it from there). She was able to put some small dice-sized cubes into a small round mini- M&M container, and although she could not put pegs into holes she had the concept and knew what she needed to do. She is very smart and we can see the wheels turning in her mind, but her hands won’t always cooperate. 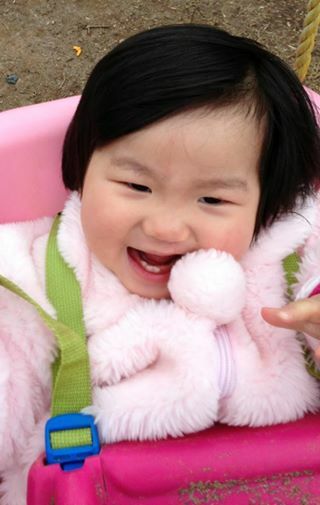 Nonetheless, she only displayed a 3 month delay when she was evaluated recently by the occupational therapist, which shows incredible progress considering she was not able to grasp anything small like a piece of food when we got her at 13 months. We are working hard with her every day and I am very proud of her progress! She is proud of herself, too. Maggie had a full evaluation from our local speech therapist and she believes Maggie does not need speech therapy regularly at this time. She has many new speech related skills emerging and the therapist said we are doing all the things she would do anyway, and Maggie is more comfortable working with us. She is not capable of making any consonant sounds other than “m” or “n” since her palate is still unrepaired. Now that her lip has been repaired we were hoping to hear those sounds, but as of her 3 week post-op appointment on January 2nd we had not. In fact, at that time she barely made any sounds at all. I was worried about her because she spent most of the day very silent. She still occasionally makes gutteral noises but those are falling away. When we first got her those were the only sounds she made to communicate. Maggie has learned the signs for “all done” and “more” and uses them consistently when eating, or when she likes what we are doing (or when she doesn’t). We haven’t been very successful teaching her any other signs, so one of our goals is to be more consistent about learning and teaching new signs. She definitely has her own way of communicating through gestures, vocal inflections, clapping her hands, kicking her feet, waving her arms, and the like–but we want to teach her more purposeful communication. She is definitely smart enough if we can just be more consistent about it. 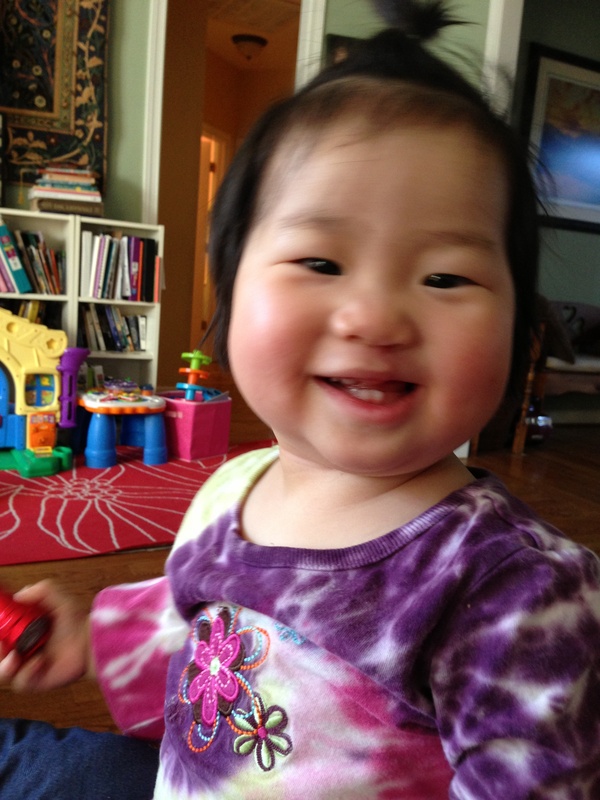 Other speech breakthroughs this past month include that Maggie is starting to put more things in her mouth. I have not had to child proof for her since she has not ever wanted to put anything in her mouth. About 3 weeks ago she put a playing card in her mouth for the first time and held it between her clenched teeth. She held her hand beneath it, as if afraid that it would fall, and she was delighted that it didn’t. Since that time she has started putting more things in her mouth–tentatively. The speech therapist at UAB gave me some oral stimulation tools that vibrate or which have nubby textures and she is now willing to put those in her mouth for longer and longer stints. When we first got those on January 2nd she wouldn’t let me bring them near her lips and now she will open her mouth and put them in herself when prompted. Last night she opened her mouth willingly to let me brush her teeth–another breakthrough, as usually she fights it. This week she learned to take bites off a bagel, and then off a cracker–up until now she has never been able to take a bite. All her food has to be torn into bite sized pieces as she has been unwilling to bite down on anything. These are all wonderful strides, and since there are so many developments and they are happening so close together it really seems like she is picking up steam and starting to turn a corner. She is making great progress in gross motor, fine motor, and speech all at the same time, so she must be having a “growth spurt”. It is fun to see things starting to click for her! The speech therapist was also happy that she is eating so well and she doesn’t show any major sensory issues. She is willing to lay on her tummy (not for long but she doesn’t hate it, either), and she will eat foods of all textures. She doesn’t mind when her hands or face get dirty while eating, and she likes her bath. It is great that she doesn’t have any truly major sensory issues. The only one we are still dealing with is her dislike of soft textures, specifically of stuffed animals and dolls or any soft toys. She also doesn’t like to have her cheek stroked–she is defensive about having her face touched. We are working on desensitizing her in both of those areas and she is showing some baby steps of progress there, too. My precious girl! We all delight in her. After five months she will finally lay her head on my shoulder and allow me to comfort her at night. 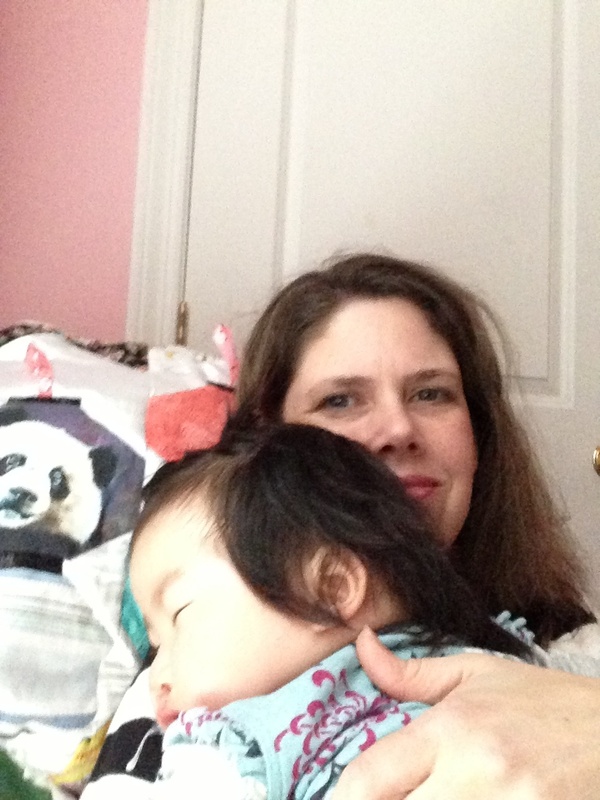 We continue to have sleep issues, especially when anything happens to upset her delicate night time balance. She finally had settled into a routine about three months after we brought her home. Then she had her surgery. It took about three weeks to get past the sleep issues that surgery brought about. Things were back to normal finally where she was going to bed at a decent hour and sleeping all night–and then she got vaccinated. She is behind on her shots and so last week she went in and got started on catching up. That threw her off again for about 3 nights. When she has trouble she either wakes up about midnight and often stays awake for two or three hours, or else she won’t settle down initially and it takes 2 or 3 hours to get her to go to bed. Her normal nights are bedtime about 8:30 and she sleeps all night, but when she is struggling it might take until midnight to get her to bed, or she may go to bed and wake up at midnight and be up until 3. Her cry at night is so different than her daytime cry. It is very mournful and heart wrenching. Sometimes she doesn’t even seem to be fully awake. Any time I have had to go in to her in the night she fights me tooth and nail if I try to comfort and soothe her. She doesn’t like to be rocked and she kicks and pushes and fights to get away from me. Yet if I lay her back down she gets even more agitated and wails and howls until I pick her up again. It is beyond anything I have ever experienced to deal with a child who cannot be comforted, and who doesn’t find comfort from mommy. And yet by her reaction if anyone else dares to try–or if I dare to lay her down–I can only assume she does receive comfort from me even if she can’t express it and she wants to fight it. For me, it is incredibly frustrating to want to comfort her but to be unable to. I am trying to rock her and soothe her while she scratches and stiffens her body trying to get away. She often seems to be awake during these times, but it is a possibility that she is actually experiencing night terrors when this happens. I learned this week from another mother who adopted from Maggie’s orphanage that she was told the nannies did not remain in the room at night in the orphanage. I can only imagine the number of nights Maggie spent crying, surrounded by other crying babies. It is heart breaking. No wonder her cry is so mournful at night. Even though she surely doesn’t remember that I am certain it is the reason why she struggles so much at night. This week we experienced a breakthrough. She finally had a night where she was willing to lay on my shoulder, sniffling and sobbing but eventually calming and settling down to sleep. It has taken her 5 months to be willing to lay her head on my shoulder and let me comfort her and rock her during a “night terror” episode. What a sweet victory, and I give praise to God for answering my prayers.